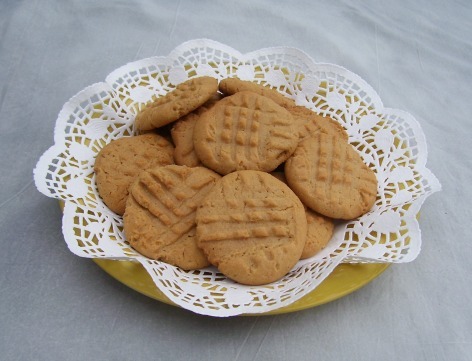 Easy Peanut Butter Cookies made with store-bought or Homemade Peanut Butter. (Instructions included). The latter adds honey and an extra step, but makes the best cookie. 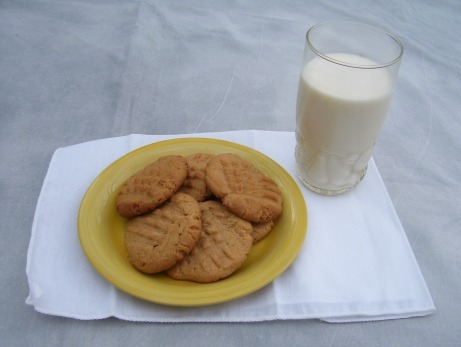 The Homemade Peanut Butter can be made a day or two, or more in advance to speed cookie baking day. Add peanut butter, butter, brown sugar, white sugar, egg and vanilla in a stand mixer bowl. Beat on low speed about 15 seconds to get the ingredients mixed together. Turn speed to high and beat one minute. Scrape sides and bottom of bowl. Scrape beaters, too. Mix another minute on high speed. Fold flour into mixture, a little at a time, until thoroughly mixed. Place ball of cookie dough in a small bowl and cover. Or roll it up in waxed paper. Refrigerate dough several hours until dough ball is firm enough to roll in the palm of your hand. (I leave mine in the refrigerator overnight). Remove from refrigerator and using the palm of your hands make 24 equal sized balls. Place balls on cookie sheet at least 1 1/2 inch apart. Make the classic peanut butter, crisscross mark on the cookies with the tines of a fork, slightly flattening the cookie. A cold-meat fork works better than a regular table fork for flattening your cookies. They have larger tines to make more prominent marks on the cookie, therefore it will be less lightly the markings will fade during baking. Dip the fork in sugar after making each mark, if it is sticking to the dough. Keeping the cookie dough cold and firm before baking helps to prevent sticking. Bake in 350F. oven 12-14 minutes of until lightly browned. Do not over bake cookies. Remember, cookies continue cooking after they leave the oven for a couple of minutes. Place cookies on a serving tray or platter and you're done. They are amazing, hot right out of the oven! Omit the store-bought peanut butter in above recipe. To make this Homemade Peanut Butter, Process the Dry Roasted Peanuts in a food processor, no more than 1 full cup at a time. (Do not use a food blender). It is best to process (grind) your peanuts about 1 minute at a time). With a heavy spoon, stir your ground peanut around to even them out in your machine. Your peanuts should be finely ground within 1 minute. With a heavy spoon, stir your ground peanut around to even them up in your machine. Cover and process 1 more minute. Your peanuts should be resembling store-bought peanut butter by now. They may be starting to form a ball. Stir peanuts again, cover and process another minute. This third minute should have your peanuts releasing their oil. You should have a thick spreadable, and very tasty butter at this point. If not, process mixture a little longer until it does. Add this butter along with the honey to your recipe above before mixing. NOTE: You will find that your cookies have a distinctly stronger peanut flavor. The honey also enhances the flavor. *For best flavor, read the peanut's ingredients list to make sure the roasted peanuts DO NOT contain oils other than peanut. This homemade spread can be used on crackers, in sandwiches or in other recipes. It is awesome for dipping fresh apple slices or spread on bananas.